Keyssa Kiss is the name of the most amazing way to dock a device I've ever laid eyes on. See those two tiny little black squares on that plastic board? Those are the connectors. And they don't even need to touch your phone, tablet, or laptop PC. 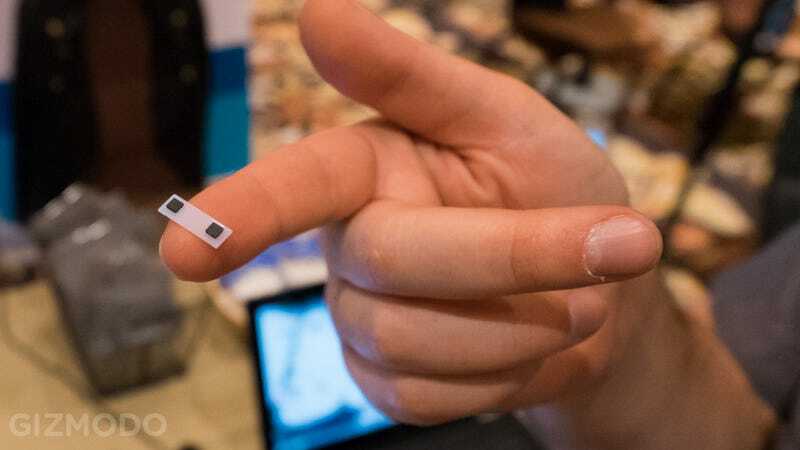 They live beneath the surface of your device, and its dock, using extremely short-range, high-frequency wireless signals to transfer data at up to 6 gigabits per second. No need for bulky metal connectors. Now get this: pair it with Qi wireless charging, and you don't need connectors to charge your laptop either. No holes in the sides of your machine. And if you supply just enough power to, say, power a speedy little external solid state drive, you could simply touch that to your machine to immediately transfer files from it, too. Keyssa's 3D-printed solid state drive enclosure. No exposed metal anywhere. That's exactly what Keyssa is showing off at here at CES, and since it has to be seen to be believed, we took this video of their tiny solid state drive plopped right down on a laptop, and then transfering a file to that laptop at hundreds of megabytes per second. No wires, no ports, just data sucked in like osmosis. It's called Kiss, like in Keep It Simple, Stupid. Are you thinking that this is stupid, that perhaps people should just transfer everything over Wi-Fi instead and not have to tap devices together at all? Sure, but then each device would require a Wi-Fi radio chip and a battery to power it. Check out how tiny this solid state drive is with no need for batteries or cords. And Keyssa says the tech is priced competitively (as far as manufacturers are concerned) compared to plain ol' ports. The kicker? The company's chairman is Tony Fadell, the CEO of Nest and the designer of the original iPod. "For the last 25 years, I've had to struggle with delicate metal connectors that put unsightly holes in otherwise beautiful products," Fadell told Bloomberg Businessweek in November. "I expect kiss connectivity to spark an immediate wave of industrial design innovation." Keyssa says that it's working with top-tier device manufacturers now, and products with the connectors should begin shipping in the second half of the year.